The YippieYo Crossbuggy is a brilliant concept. This new, high quality, safe off road buggy is designed to carry two children between the ages of 1 and 6 years old. It is designed for all terrain use and is light, stable and agile even on difficult terrain. 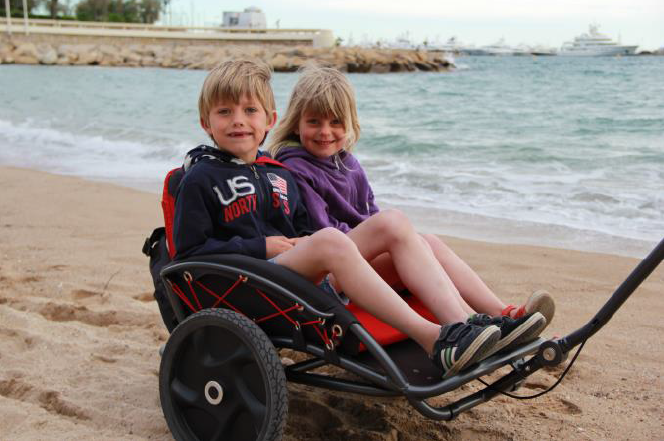 This pull along buggy has an aluminium construction and two large wheels for easy towing. There is a brake situated on the curved handle bar to ensure a controlled descent! The YippieYo Crossbuggy is easy to transport. The backrest folds down; the towing bar removes; and then wheels have a quick release. Customers can configure their own YippieYo Crossbuggy stroller in the YippieYo webshop. They can choose the colour for the frame, wheels and seat cushions to create a unique YippieYo for their family. All production is done in Germany / Switzerland, and the final production employs people with disabilities in Southern Germany. It is clear from the images, that the YippieYo Crossbuggy is a huge amount of fun, and we hope we can try one out here at BBHQ soon.